The team that developed the first multiple robot system under the leadership of Professor H. Levent Akın, Dean of Boğaziçi University’s Faculty of Engineering and lecturer at the Computer Engineering Department, participated in the 19th RoboCup World Competition in China. The team competed in the RoboCup Soccer category with a soccer team consisting of robots. The soccer team reached the quarterfinals and therefore will not have to go through the qualification process to participate in RoboCup2016. The BU team was led by Prof. Levent Akın and comprised graduate students Okan Aşık (Captain), Binnur Görer, Metehan Doyran, Berna Erden, Yasemin Usta and Bahar İrfan. 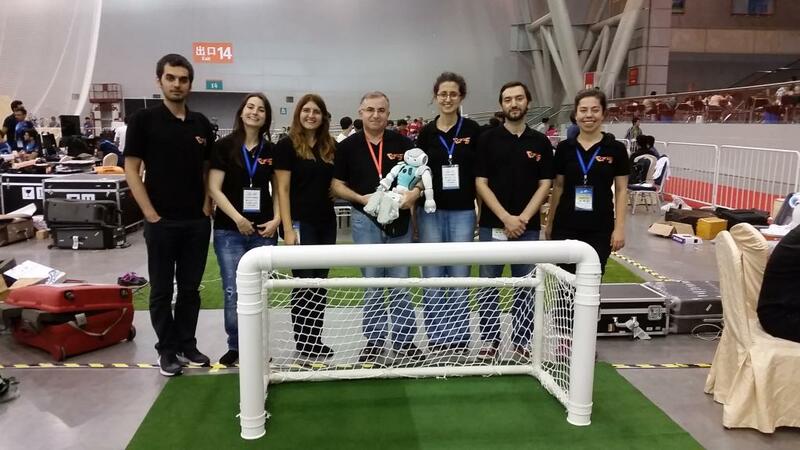 Competitions were held under 12 categories, and the Boğaziçi team competed in the Humanoid League of RoboCup Soccer category with a team of humanoid robots and reached the quarterfinals. This achievement has enabled the BU team to participate in RoboCup2016 to be held in Leipzig, Germany, without having to play in the qualification games. RoboCup was first held in 1997. Since then, it has been held in a different country every year, often during international sports events such as the Olympics or World Cup Championships. Boğaziçi University hosted the RoboCup Competition in 2011. Prof. Levent Akın, who is also a member of the RoboCup World Federation, stated that the primary objective of this competition was to enable the world to watch a soccer match between two teams, one of human players and the other of robots, that will be played in the World Cup Games to be held on July 17, 2050. He added that this game will be played by FIFA rules.